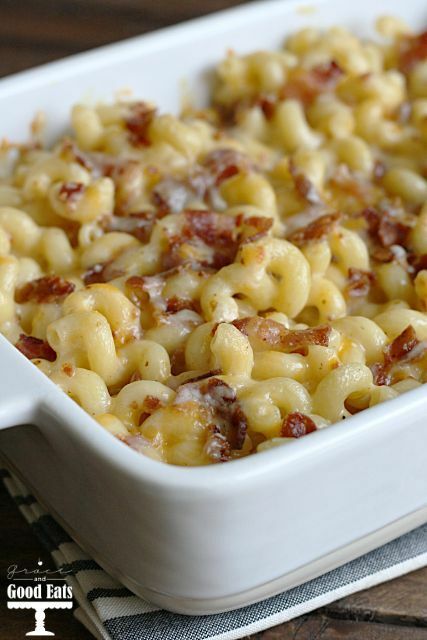 Cheesy macaroni and cheese with bacon. Heat oven to 350 degrees. Coat a 3qt baking dish with nonstick cooking spray. In a medium saucepan, melt butter and flour together over medium heat. Slowly whisk in the milk, pouring in a thin stream and stirring constantly. Stir in onion powder, salt, and pepper. Allow milk mixture to come to a boil, then reduce heat and simmer two minutes. In a large bowl, toss together cheddar, colby-jack, and mozzarella. Whisk in sliced cheese and 1 1/4 cups of cheddar mixture. Remove from heat. Toss the bacon pieces in with remaining cheddar mixture. Combine pasta and cheese sauce, toss to coat. Pour half into prepared dish and sprinkle with a generous cup of the bacon-cheese mixture. Repeat layering. Bake for 20 minutes, until cheese is bubbly.